Pro-European Union (EU) candidate Boris Tadic won the final round of Serbian Presidential elections on February 4. Tadic beat nationalist Serbian Radical Party candidate, Tomislav Nikolic, by a little over two per cent of the vote. His win is largely attributed to the Serbian expatriate vote. The central election issue was the status of Kosovo. Serbia's southernmost province has been under UN tutelage and occupation since the NATO bombing campaign of 1999 forced Serbian forces out of the province. 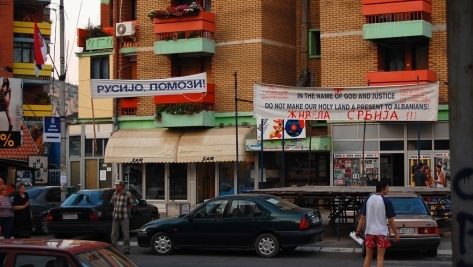 Kosovo holds historic and religious significance for Serbs. Now, for many Serbs, the province has become a symbol of US and European attempts to weaken and break apart the former Yugoslavia, and now Serbia. Less symbolic crises -- such as widespread unemployment, sub-poverty wages and restrictions on migration -- loom in the background, but have yet to share in the electoral spotlight. European and US diplomats hailed the election results as an endorsement of their policies. "The results for me at least signalled the wish of the majority of the people in Serbia who want to continue the path towards Europe, and I'd like to say Europe is very happy with that," EU foreign policy chief Javier Solana told reporters. The day after the election, the EU announced a new force of 1,800 "police and legal officials" to be deployed to Kosovo, which has been under UN administration for the past eight years. The EU did not announce their decision before the election, arguing they did not want to "interfere" with the outcome of the vote. With Kosovo expected to declare independence in the coming weeks, the EU's move has thrown the Serbian government into crisis. Any move to support EU efforts towards Kosovo's independence would be deeply unpopular, and would likely trigger another election or a place in a coalition government for the Radical Party. 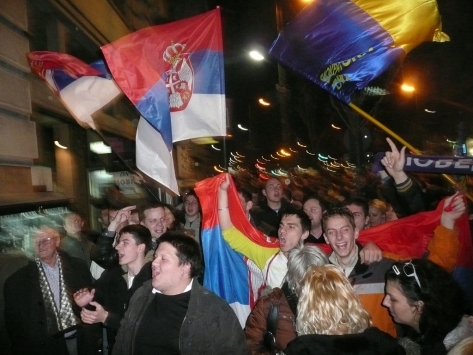 Half the Serbian population supported the Radicals, led by Vojislav Seselj. Seselj could not stand for election; he has been imprisoned at The Hague for five years, awaiting trial for crimes against humanity. He is viewed by many as a symbol of Serbian defiance against foreign imperialism. Tadic, on the other hand, represents compromise. He made it clear during his campaign that Kosovo should remain a province of Serbia but that European integration was the primary goal, and that sacrifices might have to be made. Serbia currently faces a 50 per cent unemployment rate. The average income remains 300 Euros a month. Serbs face tough visa restrictions and the vast majority of people under the age of 30 have never left the former Yugoslavia. Some observers say fundamental issues are being overshadowed by concern over Kosovo. Igor Todorovic, editor of Privredni Pregled , a Belgrade-based economic daily, said Serbia’s two main political parties are using the Kosovo conflict to their advantage. "By making the Kosovo issue such a constant issue, by filling the headlines everyday, it means they managed to neglect all the other problems that they actually have the authority and the power to solve." 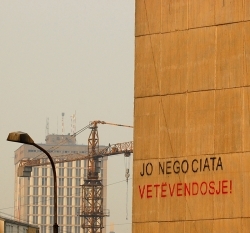 When the news of EU plans for the Kosovo mission broke (without consultation of Serbia), Prime Minister Vojislav Kostunica cancelled the meeting in which he intended to sign the integration agreement between Serbia and the European Union. Newly-elected President Tadic wanted to go along with the signing regardless of the EU decision. Many felt Tadic was bowing to international pressure and disregarding the views of people of Serbia. Before assuming his current role, Prime Minister Hassim Thaci was the leader of the Kosovo Liberation Army (KLA), an organization funded by the smuggling of illegal arms, drugs and people, and likely on the receiving end of significant CIA backing. Analysts are nearly unanimous in predicting the fall of the new government. It has become evident that eight years of UN occupation has done little in terms of benefiting most people living in Kosovo -- either the Albanian majority or the Serb, Roma or Egyptian minority groups. 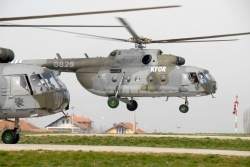 It is estimated that between three and five billion dollars in "international aid" has been pumped into Kosovo since the 1999 bombing, which resulted in over 250,000 Serbs and Romas from the region becoming refugees. 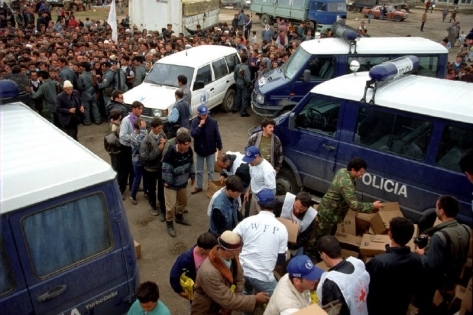 An estimated 300,000 Albanians fled in the months preceding the escalation of fighting between the Serbian army and the KLA, and the resulting addition of NATO forces and bombings. 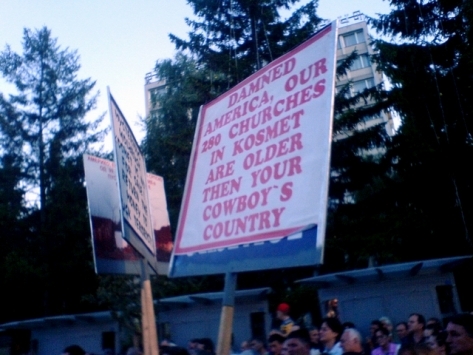 The result was Kosovo as a UN protectorate, its population unable to determine its own affairs. Today, there is no clean drinking water throughout the province. Electricity is sporadic and can be out for 12 hours at a time. Despite these conditions, the UN maintains that "much progress has been made." Corruption is rampant. International organizations and institutions based in Pristina often repeat the "need to address the problem," but Kosovars are skeptical. Avi Zogiani is with the Anti Corruption Organization, a grassroots group trying to keep track of aid money-fueled deals in the area. "The so-called government of Kosovo is in a constant state of readjusting ideas of development to coexist with economic and industrial interests of the outside world," says Zogiani. "With eight years of having no influence on the political process, on decisions, the people have given up on trying to guarantee any of their rights and instead choose to suffer at the whims of the international actors and players." Privatization of state-owned resources and services is nearly complete. The coal factory is the latest to be sold off, and the development wing of the US State Department is in charge of much of the operations of its sale. This involves regular consultation with the energy minister and handpicking the NGO that would do the "outreach" to "educate the population on the benefits" of privatization. Over a billion dollars already has gone into this coal plant, and it still suffers from daily blackouts. The expected buyer, a US-Czech company CEZ has promised an additional $3.1 billion in investment to make it operational, if they get the deal. Zogiani believes part of the last ditch dealings could involve ensuring major players in the current UN force receive more of the privatization booty before the UN moves out and the EU settles in. Kosovo has become a diplomatic and geopolitical flashpoint, with Russia backing Serbia's opposition to full independence. Meanwhile the US State Department and EU have taken an aggressive stance in favour of independence, using EU membership as a carrot and the country's economic woes as a stick. Russia holds the powerful UN Security Council veto, and can to block any attempt to push through a resolution. With opposing positions set by the two sides, the future looks dismal for the people of Kosovo caught in the middle. Alexander Popadic, editor of Kontrepunkt, a widely-read independent popular web forum, magazine and grassroots media organization based in Belgrade, expressed frustration with both the Russian and American influence in the region. "The presence of Russian Big Brother in the minds of Serbian people and the US for the Albanians has to be cut off," said Popadic. "Such steps are necessary if we are to see some real progress and independent development of this region. Stuck within the process of so-called unfinished modernization, with the burden of wars and neoliberal reforms, Serbia and Kosovo are deeply polluted with nationalist hatred, religious fundamentalism and social insecurity." A declaration of independence is imminent. Most EU countries and the US have already signaled they will immediately recognize Kosovo's country status. Few people in Serbia seem ready to physically fight for Kosovo again. However, many politicians have shown they are not willing to hand over the province. The only certainty is that people in both Kosovo and Serbia will continue to live in desperate conditions with few opportunities. The international institutions which speak of peace and prosperity for the region have in fact delivered the opposite.